Considering a move from green grass? 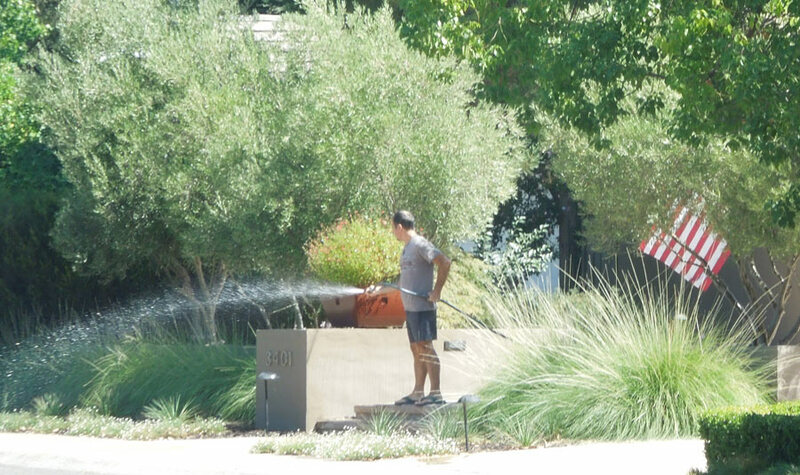 As water becomes more scarce and valued in California, there has been a shift away from growing a traditional front lawn of grass. 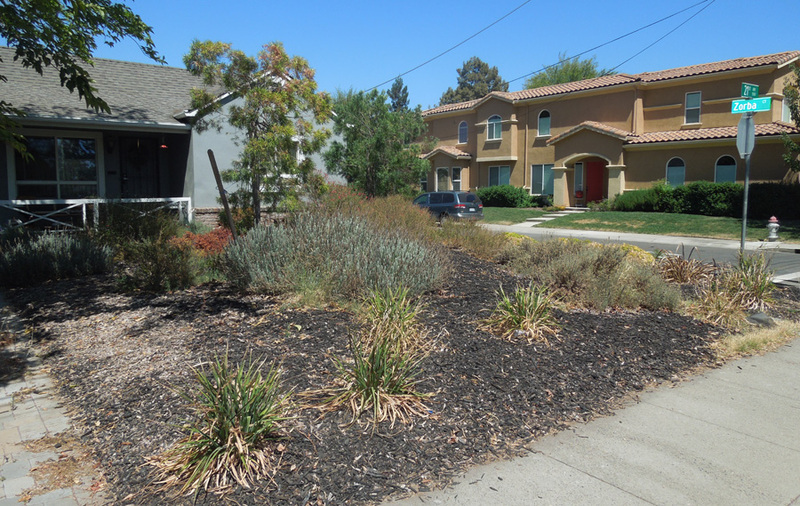 I collected some examples of landscaping without grass, including some with drought-resistant plants and some with no plants at all. I tried to create a visual resource for people considering a switch from lawn, but who are unsure about what they want their future front yard to look like. Olive trees and Ornamental grasses. 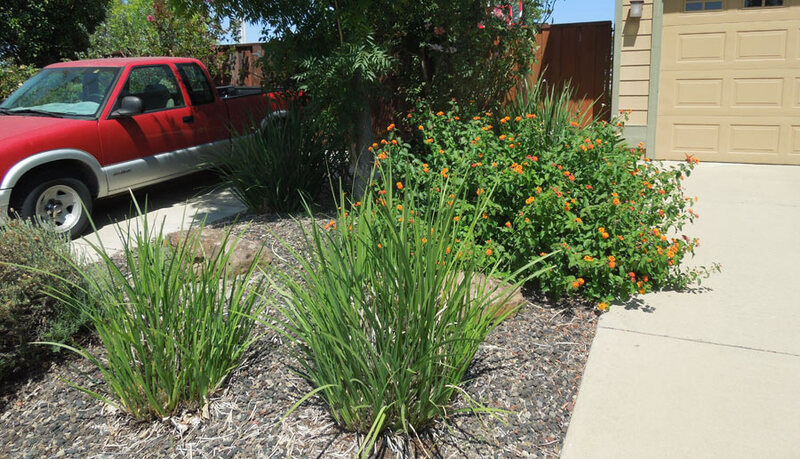 Here's an example of a drought-resistant yard. It has clumps of plants, scattered in an interesting way across the landscape. 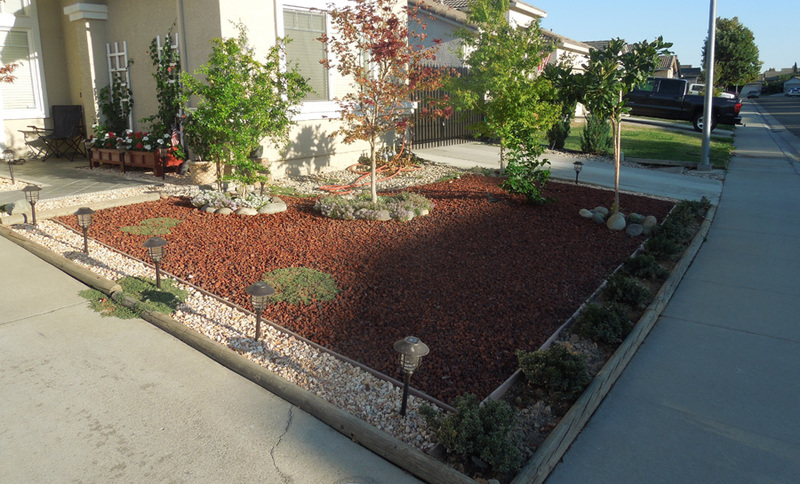 The rest of the yard is covered with black bark mulch. This is an example of a yard which doesn't have a raised border around the perimeter, which you can see can allow the bark to spill out onto the walkways. 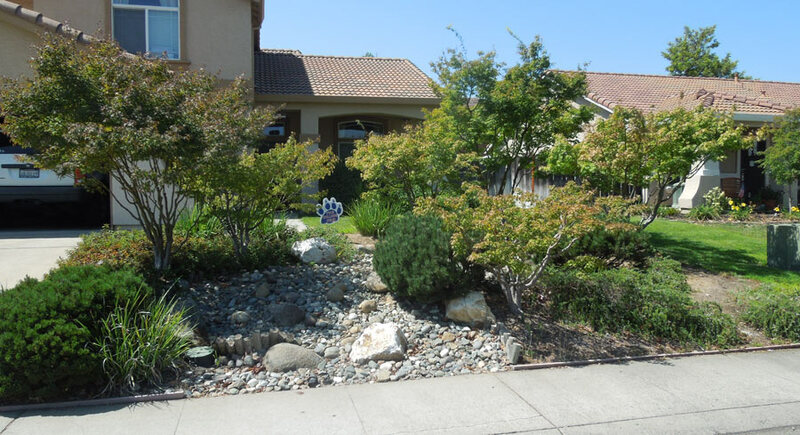 Here is a beautiful yard in Folsom, CA. 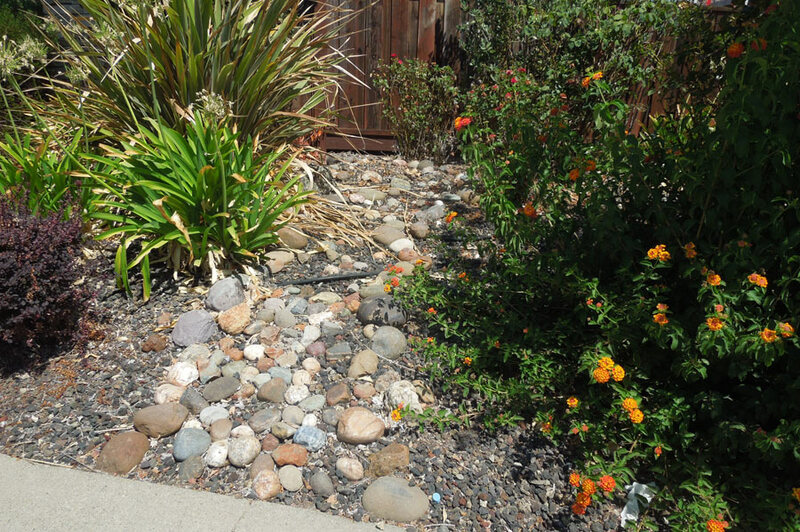 The center features the look of a "dry creekbed". Its strength is the variety. 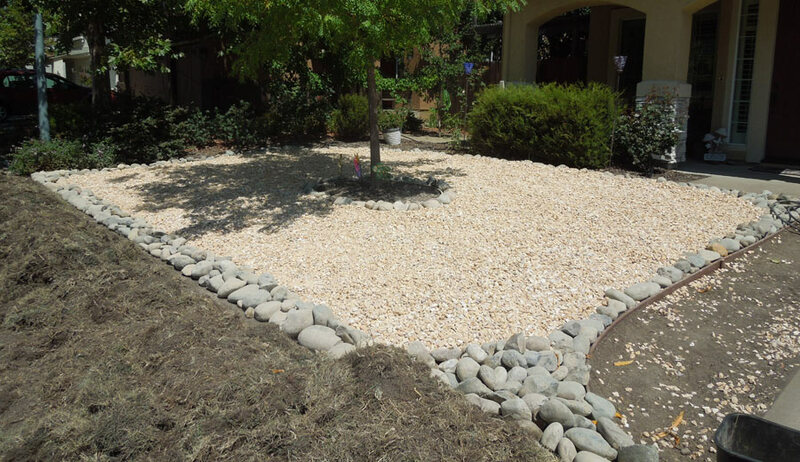 This yard has at least four kinds of trees, four kinds of rocks, two styles of decorative borders, a hill, shrubs and bushes. It is awesome. The trees look like acer palmatum, maybe shigitatsu sawa They short green bushes are a dwarf pine cultivar like mugo pine it looks like. The grassy like shrub might be African iris. 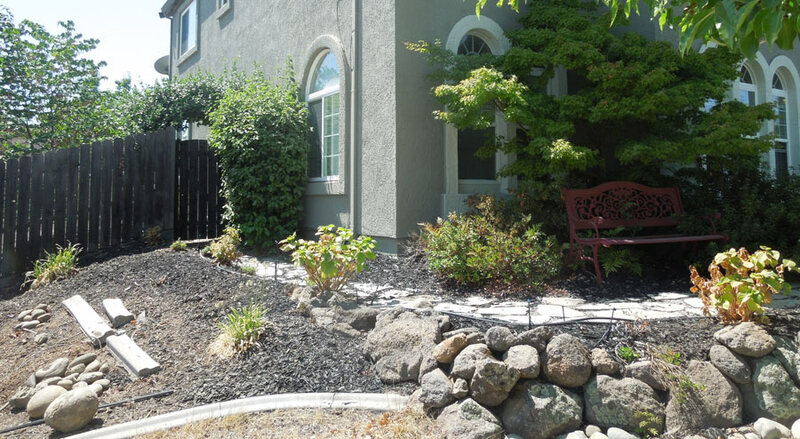 Here is a grass-free yard in Sacramento. There are two rows of shrubs, with a field of shrubs in between. Only in California do you see palm trees right next to pine trees. The land between the plants has no mulch or ground cover. Here's one solution for a lawn accent: a 1991 Corvette. 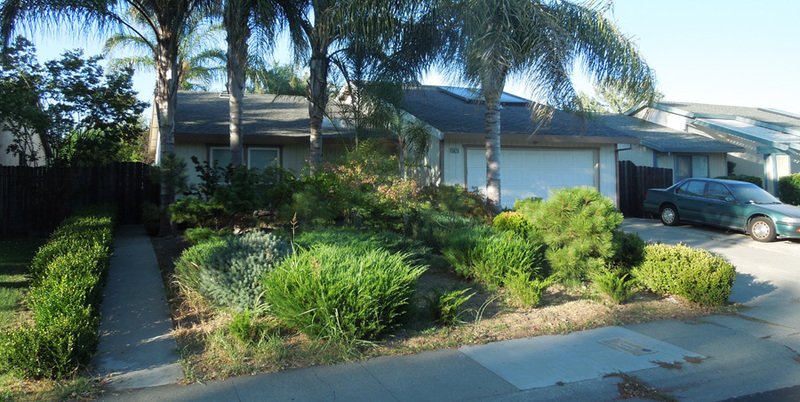 This house had a very large front yard, which requires a lot of plants to fill it up if you aren't using grass. The area between plants is a wood-bark mulch. I've been assured that these succulents will grow to fill this yard. 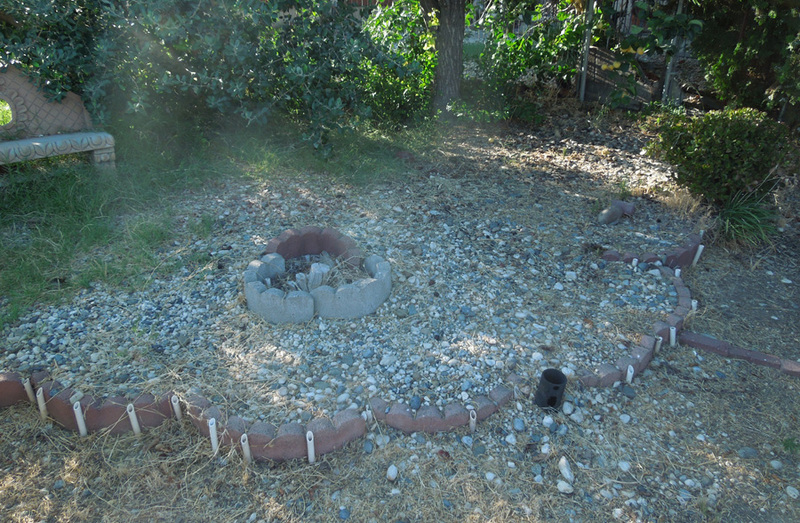 Here is a terraced yard with mulch on the inner circle and bark on the outside. 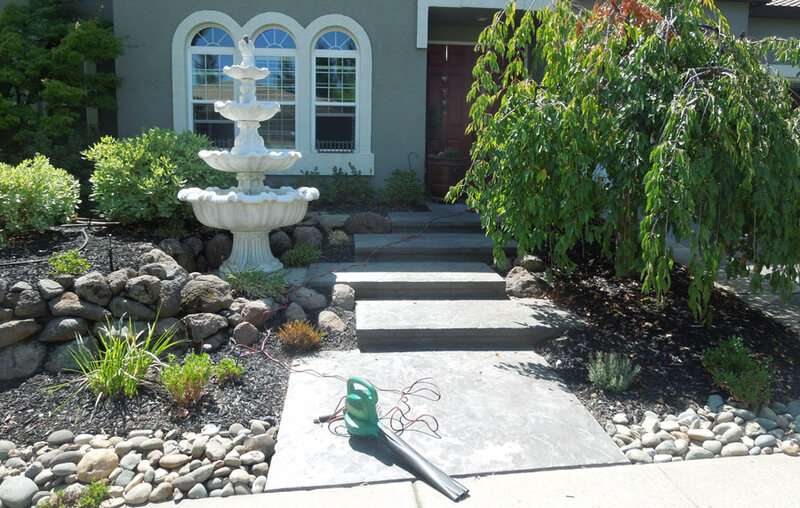 The lawn has a decorative concrete border. 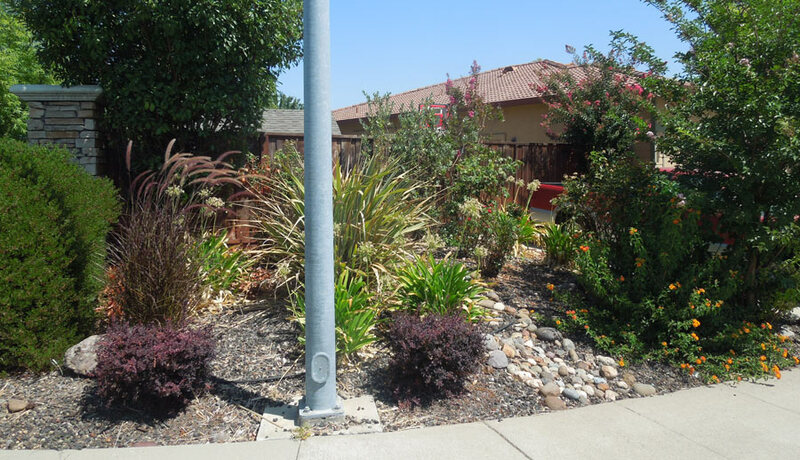 Here is a section of a yard with mature plants and black bark. They got away with no border. Mini-micro dry creek bed, or possibly a pathway. Almost too much variety on this corner of the yard. A real menagerie. 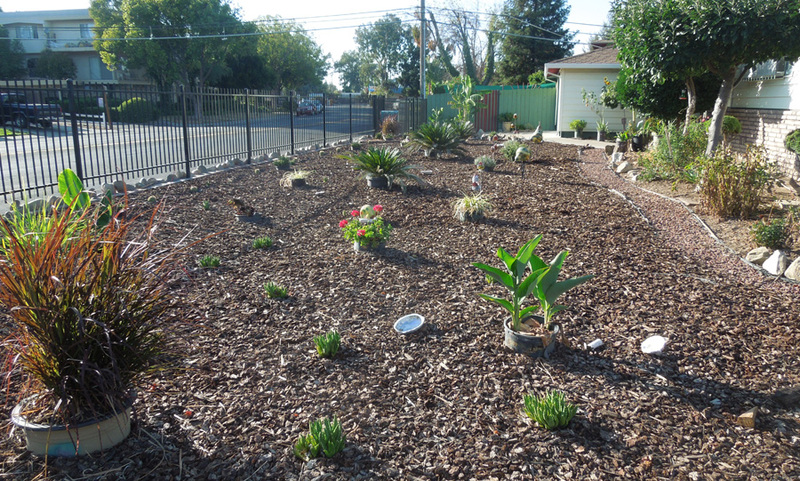 Here's an example of a no-water front yard. It isn't just a field of red rocks, it has white rocks, red rocks, big rocks, bricks, edging and wall stones along the front edge. It has variety, but it isn't particularly attractive. I think one problem is that the larger grey rocks are too evenly spaced. It looks like a bad plan instead of a re-creation of nature's random hand. I met this gal while she was tending her garden. She didn't have a lawn, but enjoyed working on the plants out there. She let me know that she didn't have to be out there as much as she was, but that she enjoyed it. 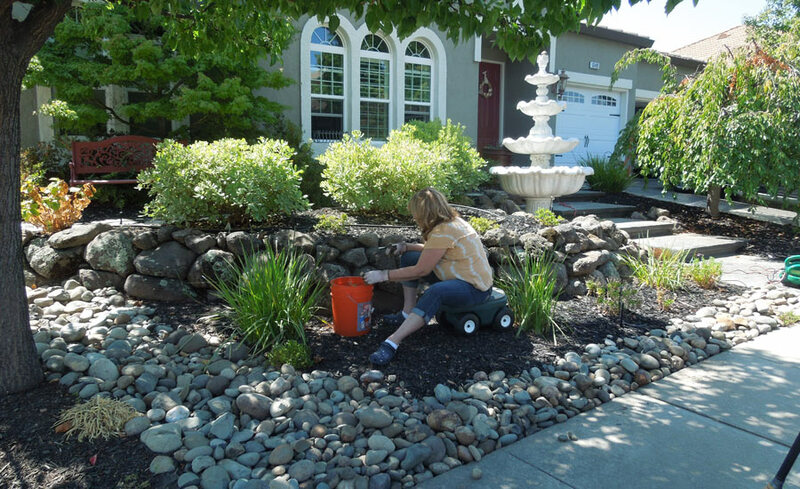 In most cases, getting rid of the lawn means getting rid of a considerable maintenance burden. This side of her lawn was getting more sun than usual, because the neighbors had just removed a shady tree. Be wary of front lawn decor such as this bench. If a person can lift your decor, it may be stolen in the night. This fountain is probably too heavy for a casual landscape thief, but it will use water. 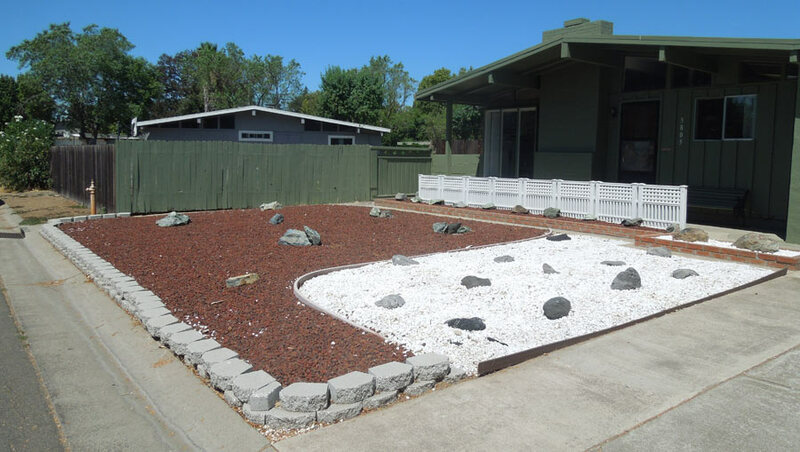 This yard is a good example of simplicity in rocks. 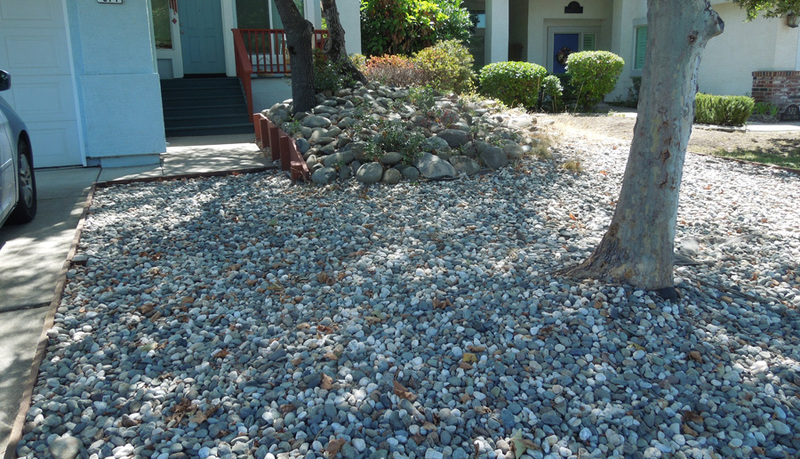 These are medium river rocks with a patch of larger rocks up near the porch. Mature trees provide almost enough variety for this to be an attracive lawn. They used a plain wood border. 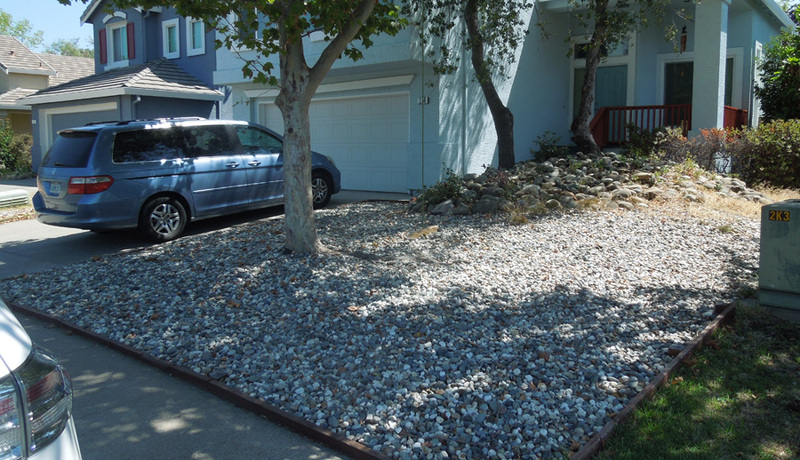 This lawn had a wide rock border, lights and trees. 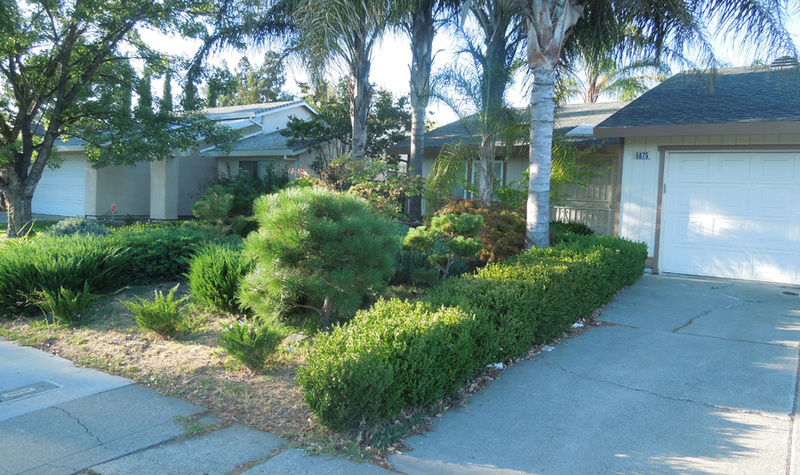 Here's a yard with an expiring landscape scheme. 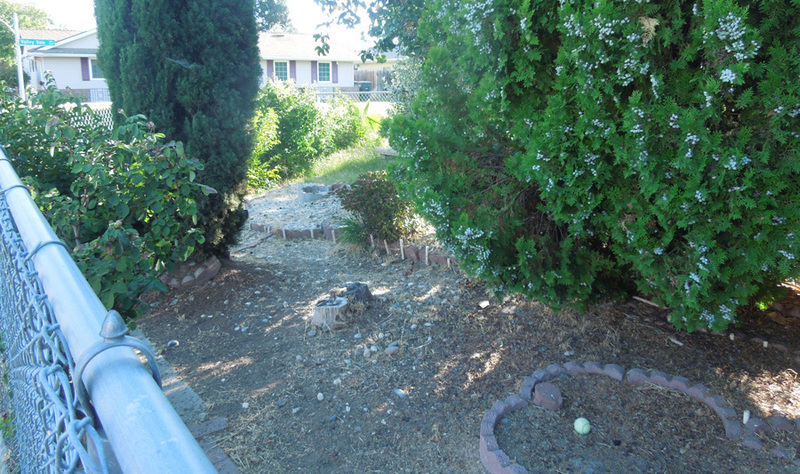 The borders remained, and large bushes were thriving, but there was a lot of plain dirt. I bet this landscape has been neglected for 20 years. I caught this house mid-lawn removal. They were a little annoyed that the price of removing a lawn was so high, but they had a plan and were committed to seeing it through. A regular dumpster would have been $60, but sod was forbidden in a standard dumpster. To have sod removed, they needed this $200 skid! Amazing. They had called 14 people for help having the lawn removed, but they got only three responses, and the lowest quote they got was in the thousands of dollars, so they opted to try it themselves. They spent $400 on rocks. It had a nice, simple look, but they wished that they had run the irrigation to the trees and bulbs before they put the rocks down. Also, they asked me to remind readers that their communities might have a rebate available to homeowners who remove their lawn. 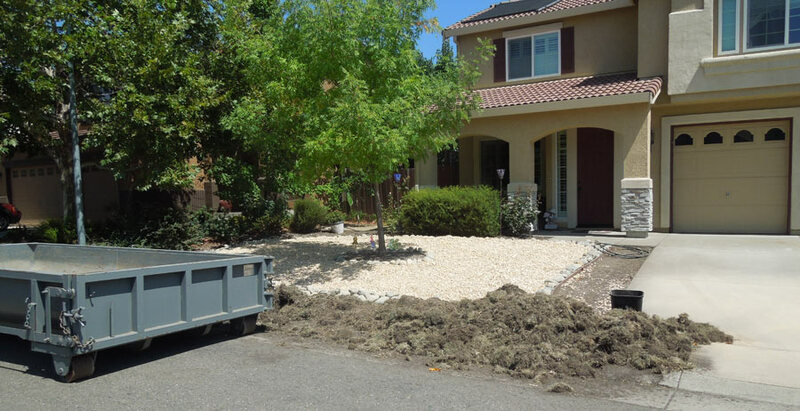 A way to avoid scraping and hauling sod is to plant on top of it using sheet mulching.